First off was the accessibility. In both Napa and Bordeaux you are better served with some advance planning and reservations. You get to taste better quality wines, get a better understanding of the story behind the wine and get more personalized attention. But here the distinction lies in the availability of walk-in tasting rooms and weekend hours in Napa. It is next to impossible to walk onto an estate in Bordeaux and do a spontaneous tasting. And forget weekend visits unless it is Portes Ouvertes. Napa, on the other hand, has an abundance of walk-in tasting rooms. In fact, Highway 29 has helped Napa earn its reputation as “Wine Disneyland,” where you can basically crawl from tasting room to tasting room to tasting room. The downside of this is of course the proliferation of tourists (or is that an upside?) and the lack of personalized attention. Secondly, in a point that strongly correlates with my first point, is general staff knowledge. In Bordeaux you are greeted by dedicated hospitality staff that is extremely knowledgeable. In Napa, unless you are at an advance reservation at an exclusive property you are unlikely to find a staff member who can speak knowledgeably about the vineyards, the details of the winemaking process and the different wines themselves. Of course this is a bit of a generalization/stereotype, but on my most recent trip I found myself very frustrated by the lack of intelligent engagement. Again, I am a wine snob and a wine nerd, so ignore me. Then of course there is the general attitude. A Bordeaux estate is doing you a favor by allowing you to trespass on their hallowed ground and savor their precious nectar. God forbid you aren’t dressed appropriately or don’t ask the right questions. Napa is just glad to see a customer or engaged enthusiast. No question is a stupid question and they are happy to welcome you with a glass. Again this makes light of my many amazing experiences in Bordeaux. But there is a distinct difference. There is also the ‘delicate’ issue of purchasing bottles. The Place de Bordeaux system complicated direct sales at the estates. Most of the annual production is sold via the en primeur futures system and the estates maintain a small private reserve. If the estates do even offer direct sales, the bottles are priced at or above the highest market value. Because it would not do to undercut the negociants who act as the global sales arm. Many estates just opt to avoid the potential pitfalls all-together and refuse to sell direct. Whereas in Napa you find producers who only sell 5% of their production via retail, with the rest being sold directly to the club roster or through the tasting room. Everyone in Napa is happy to sell you a bottle or a case. Of course they also try to respect retail pricing but the diversity of offerings allows for the production of distinct or exclusive retail offerings. This brings me to the diversity of offerings. Bordeaux sells Bordeaux blends and Bordeaux blends only. An estate may offer a first, second and potentially a third wine as well as maybe a white offering. Maximum. And that is if you are lucky. Whereas in Napa estates may produce multiple cuvees, vineyard designates, different varietals, offerings from multiple appellations and mimic multiple old world regional offerings (i.e. both a Bordeaux blend and a Rhone Valley blend). This of course has aided with the development and proliferation of direct-to-consumer sales avenues such as tasting rooms and wine clubs. In Bordeaux the lack of numerous wine offerings is a distinct barrier to the creation of an effective wine club, a problem compounded by the Place de Bordeaux wine merchant and futures system. And finally brings me to some of the more technical differences. Much like the differences discussed above, many of these are generalizations but they nonetheless offer an overview. One of the most noticeable differences (I notice it immediately in the glass) is the use of fining and filtration techniques. In Bordeaux, in addition to habitual racking off of the barrels, wines are routinely fined with the traditional egg whites and salt or more modern compounds. However, the big Napa Cabs tend to be both unfiltered and unfined, leaving a small amount of sediment behind and a touch more texture on the mouthfeel. I greatly enjoy both styles – one offering a slightly more polished feel and the other a slightly bolder texture. In addition there is the tendency to use native yeast. In Bordeaux, winemakers leave nothing to chance, choosing instead to select specific yeast strains that produce specific effects in the wine. On the other hand, winemakers in Napa tend to rely on the yeasts found in the vineyards. This is also where I admit to a gap in my knowledge. I don’t know if there are differences in the terroir and weather patterns that facilitate the use of native yeast in Napa. Although this comparison is slowly falling apart as native yeasts gain popularity in other regions of France and winemakers in Bordeaux become a bit more adventurous. It also fails when looking at Napa estates with strong French ties, as these producers tend to stick to a French winemaking model. There are also the rules and regulations governing the wine making process. In France winemakers are bound by the strict cahier de charge of the individual appellations. As a result in Bordeaux the winemaking tends to be a bit more formulaic. Winces macerate for a pre-set number of days. Fermentation is jump-started with yeast infusion and temperature control. Wines are aged in barrel for a predetermined period of time with routine treatments (i.e. rackings, finings, etc). Whereas in Napa the rules governing wine making are much more fluid and thus winemakers are free to ‘listen’ to their grapes. Technique may be adapted from year to year. But please don’t take this to mean that Bordeaux winemakers do not manipulate their wine or work to manage the vintage effect from year to year. Of course Napa has less of a vintage effect than Bordeaux, mostly because the weather is less variable. Spring is mild and wet, summer hot and dry and fall is mild. The coastal mountains provide protection from coastal winds and storms. In Bordeaux, the Gulf Stream weather pattern is highly changeable and the consistent rain/humidty bring challenges associated with rot (a good thing in Sauternes) and other diseases. But aside from grape and vine health, the Bordeaux weather pattern also greatly affects both physical and phenolic ripeness. The result is often grapes that struggle to reach physical ripeness, with lower sugar levels and higher acidity. 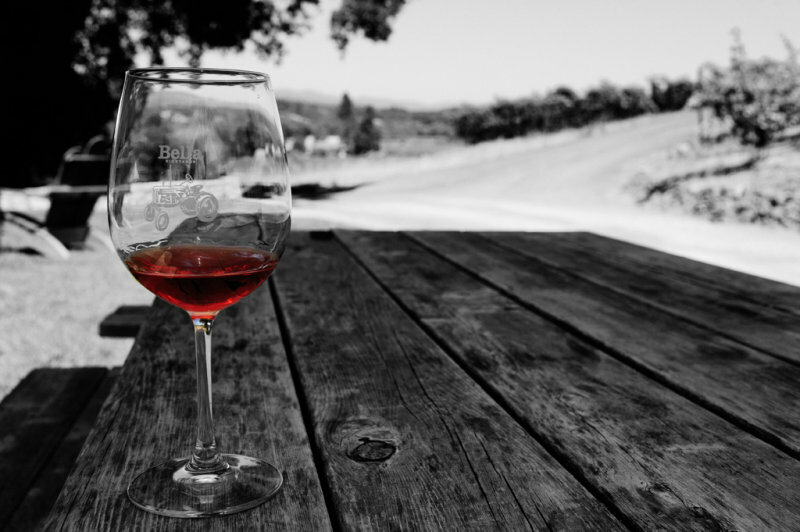 In Napa consistent summer heat brings riper grapes with higher sugar, and thus higher alcohol, levels. Napa grapes also struggle to preserve their acidity and phenolic ripeness is harder to achieve. At its core this is (at least in my mind) the greatest difference between Napa and Bordeaux. The different grapes will always produce different styles of wine. No matter the differences, both of these world-renowned wine making regions produce superb fine wines. And the best way to discover the differences between the two is to start tasting. So grab a glass! Cheers! This entry was posted in Estate Visits, Wine World and tagged bordeaux, Estate Visits, napa, new world, old world, wine tasting by Aliye M.. Bookmark the permalink.